When it comes to staying warm on a motorbike, the traditional option is to layer up, loads of jumpers and thermals, but end up feeling like a Michelin man with restricted movement. These days however, there’s loads of great electrically heated gear on the market, from gloves and socks to vests and pants. All nice thin layers that keep you toasty without bulkiness. The only problem is, much of this serious gear comes at a serious price. It’s at this point you may have noticed a lot of very cheap heated clothing on eBay from China. It can’t all be that bad, can it? So in the name of research, we picked up a heated vest for the princely sum of £20 (delivered). A far cry from big name brands costing £100-150 or more. Read on to see if we wasted our money or found a little far Eastern gem. First impressions were pretty good, no obvious flaws in seams and construction. 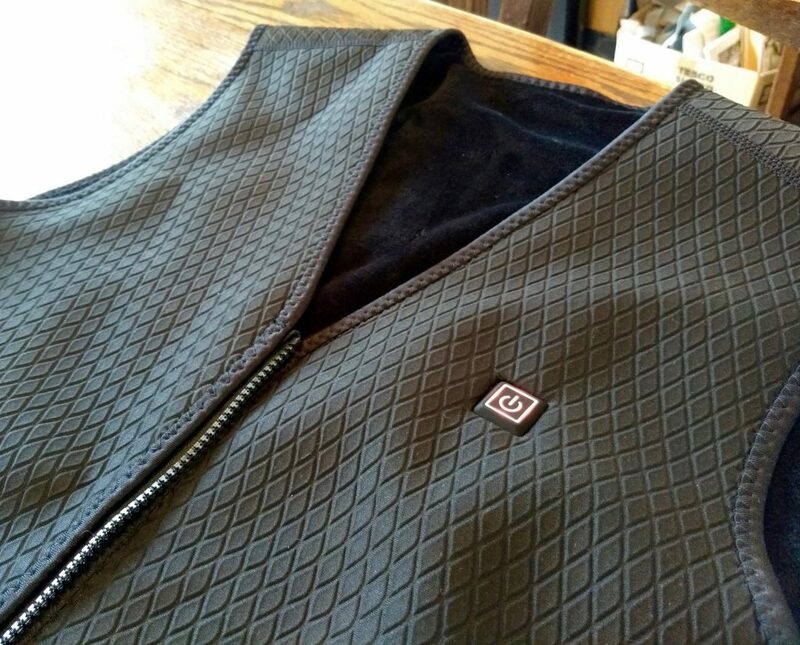 The vest has a deep V-neck design with a short zip and a diamond embossed neoprene outer, like some classy body warmer. It’s lined with a very soft thin plush of almost velvet feel, and then all the edges are finished with a roll over piping. The heating wires can be felt within if you search, but aren’t noticeable day to day. 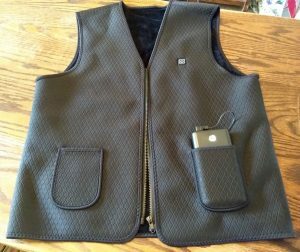 There’s two pockets on the front, one containing a 15cm USB cable to power the vest and accept a battery, albeit no battery was supplied with the vest. Any generic battery with a USB socket will, as you may have already for recharging your phone. 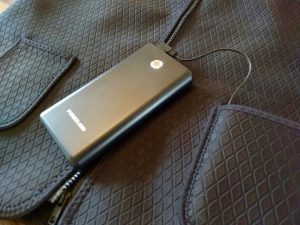 We picked up a big 2000mAh Li-Po battery for another £20 (a PowerAdd Pilot X7), which fits snuggly and keeps it powered on high for several days worth of journeys. 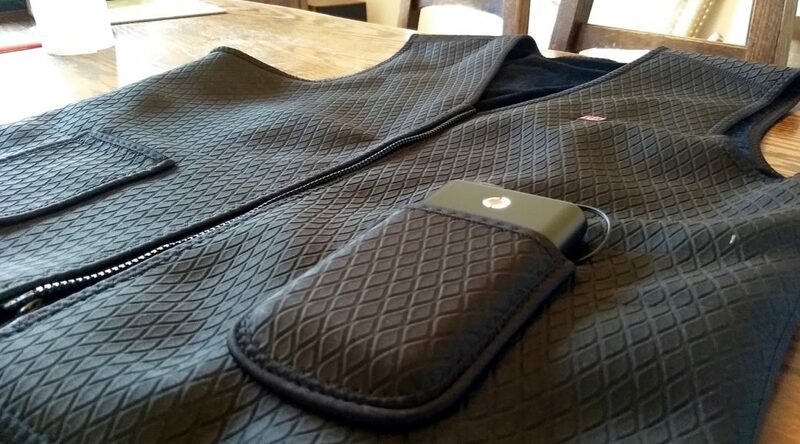 It also has multiple USB sockets on it, giving the option to charge a phone in the other vest pocket. A small rubbery light up button on the left hand breast turns the vest on and toggles heat level. A long press for on-off, or a quick tap to cycle high, medium, low with associated red, white and blue coloured lights. Product blurb claims these settings provide 65C, 55C and 45C temperatures respectively, however I’ve not measured to confirm this. 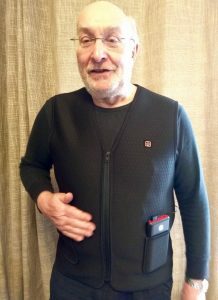 With the large battery in pocket, it does have a little bit of weight (560g for vest, plus 370g for battery), but certainly not bulky and the vest easily slips on under a bike jacket. When turned on it can take 5 minutes or so before it feels noticeable warm and even on high it only provides a modest warmth to touch. However, as a layer under your jacket (which probably has a thermal liner too), you really don’t need a lot of heat. Even in temperatures around zero and riding in wet snow, it produced sufficient warmth to keep the cold away. By no means hot or enough to build up a sweat, but comfortable and ample to keep the chill away. Where the vest falls down is around the button to control it. Firstly being on the breast, you can’t see or really access it once you’ve got a thick motorcycle jacket on over the top. So, you’ve no idea what setting it’s on and it’s trial and error to try and press it through a jacket. Secondly, the button is really touch sensitive. I would often set it to high, stick jacket over the top, get down the road and begin to wonder why it’s not producing much heat. When I stop, and unzip jacket to check it out, I would then find it’s flipped to medium or low setting, seemingly having cycled through setting from light brushing of a jacket over the top. Either that or it’s got some undocumented features to only stay on high for short time, to save power or some such. Either way, not ideal on the bike. Overall, it’s not a bad little heated vest, certainly can’t moan at the £20 price or long shipping time from China. Both Mary and myself have used it and we both came to the same conclusion that it’s only the control button that really lets it down for use on a bike. Additionally, it’s also super tempting to pop on when not on the bike, even for just a walk to shops on a icy day (my Northern relatives would be ashamed…) Of course, as we’ve only had it a month, it’s too early to judge reliability, which can be issue with heated gear. But we’ll report back here later in year with our judgement of longevity.